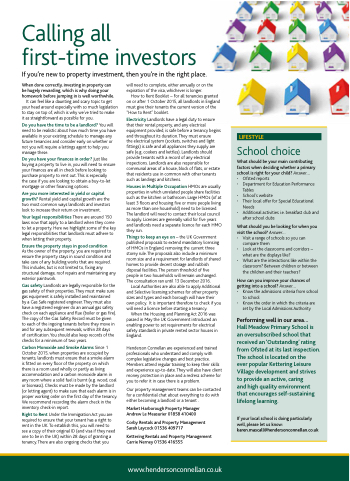 If you’re new to property investment, then you’re in the right place. When done correctly, investing in property can be hugely rewarding, which is why doing your homework before jumping in is well worthwhile. It can feel like a daunting and scary topic to get your head around especially with so much legislation to stay on top of, which is why we’ve tried to make it as straightforward as possible for you. Do you have the time to be a landlord? You will need to be realistic about how much time you have available in your existing schedule to manage any future tenancies and consider early on whether or not you will require a lettings agent to help you manage these. the case if you are looking to obtain a buy-to-let mortgage or other financing options. Are you more interested in yield or capital growth? Rental yield and capital growth are the two most common ways landlords and investors look to increase their return on investment. Your legal responsibilities There are around 150 laws now that apply to a landlord when they come to let a property. Here we highlight some of the key legal responsibilities that landlords must adhere to when letting their property. As the owner of the property, you are required to ensure the property stays in sound condition and take care of any building works that are required. This includes, but is not limited to, fixing any structural damage, roof repairs and maintaining any exterior paintwork. of certification. You should also keep records of the checks for a minimum of two years. Carbon Monoxide and Smoke Alarms Since 1 October 2015, when properties are occupied by tenants, landlords must ensure that a smoke alarm is fitted on every floor of the property on which there is a room used wholly or partly as living accommodation and a carbon monoxide alarm in any room where a solid fuel is burnt (e.g. wood, coal or biomass). Checks must be made by the landlord (or letting agent) to make sure that each alarm is in proper working order on the first day of the tenancy. We recommend recording the alarm check in the inventory check-in report. will need to complete, either annually or on the expiration of the visa, whichever is longer. How to Rent Booklet – For all tenancies granted on or after 1 October 2015, all landlords in England must give their tenants the current version of the “How to Rent” booklet. the electrical system (sockets, switches and light fittings) is safe and all appliances they supply are safe (e.g. cookers and kettles). Landlords should provide tenants with a record of any electrical inspections. Landlords are also responsible for communal areas of a house, block of flats, or estate that residents use in common with other tenants such as landings and kitchens. Houses in Multiple Occupation HMOs are usually properties in which unrelated people share facilities such as the kitchen or bathroom. Large HMOs (of at least 3 floors and housing five or more people living as more than one household) need to be licensed. The landlord will need to contact their local council to apply. Licenses are generally valid for five years and landlords need a separate licence for each HMO they run. Things to keep an eye on – the UK Government published proposals to extend mandatory licensing of HMOs in England, removing the current three storey rule. The proposals also include a minimum room size and a requirement for landlords of shared homes to provide decent storage and rubbish disposal facilities. The person threshold of five people in two households will remain unchanged. The consultation ran until 13 December 2016. Local Authorities are also able to apply Additional and Selective licensing schemes for other property sizes and types and each borough will have their own policy. It is important therefore to check if you will need a licence before starting a tenancy. When the Housing and Planning Act 2016 was passed in May the UK Government introduced an enabling power to set requirements for electrical safety standards in private rented sector houses in England. Henderson Connellan are experienced and trained professionals who understand and comply with complex legislative changes and best practice. Members attend regular training to keep their skills and experience up-to-date. They will also have client money protection in place and a redress scheme for you to refer it in case there is a problem. Our property management teams can be contacted for a confidential chat about everything to do with either becoming a landlord or a tenant . what are the displays like? classroom? Between children or between the children and their teachers? and high quality environment that encourages self-sustaining lifelong learning.